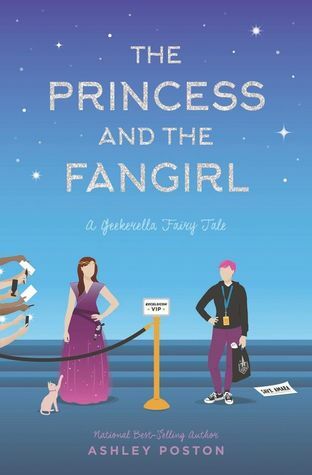 Return to the geek-tastic world of Starfield fandom with a tale of a superstar and a superfan who swap lives in this sweet and funny companion novel to GEEKERELLA. Movie star Jessica Stone can't go up onstage at another con and pretend to love Starfield anymore--except that she's contractually obligated. She never dreamed she'd be playing Princess Amara for life, but people love Princess Amara, and for better or worse, Princess Amara has Jessica Stone's face. But. it turns out, so does someone else. Imogen Weatherby is just another Starfield fan hitting up ExcelsiCon--except that she happens to look an awful lot like Jessica Stone (and no, you're not the first one to point it out). When Jess spots Imogen, she has a brilliant idea: swap places. Jessica can live her life out of the spotlight while Imogen pretends to be her on the rest of the con circuit, and Imogen can ditch her crappy barista job and finally get to see something beyond her hometown. But Jess doesn't anticipate actually liking Imogen's life--or Imogen's gorgeous best friend, Hana, who might just be the person Jess needs to forget about her ex. And Imogen loves being Jess Stone--and might even love this super talented artist, Tamaki, who she keeps bumping into. Except Tamaki thinks she's Jessica Stone. When an obsessive fan finds out the truth and threatens to expose Jess for the "fake geek girl" she is, it will take both Jess and Imogen to stand up for the truth: That there is no such thing as a fake geek girl. That if you are a fan, then you are accepted. And that even if you aren't a fan, you are worthy. That you are not invisible. That what you love matters. From the acclaimed author of Geekerella, this geeky spin on The Prince and the Pauper is a perfect story for geek girls of every fandom.